The Jerboa - They like to live where the soil is sandy, and make their burrows, or holes to live in, in the sides of sand-hills. ou will not find the name of the Jerboa in the Bible; but it is supposed to be the same animal that is called a mouse in the 17th verse of the 66th chapter of Isaiah, "They that sanctify themselves, and purify themselves in the gardens, eating swine's flesh, and the abomination, and the mouse, shall be consumed together, saith the Lord;" and also in Leviticus, where God is telling the children of Israel what animals they may be allowed to eat, and also what they must not taste. He says, "These also shall be unclean to you among the creeping things that creep upon the earth; the weasel, and the mouse, and the tortoise after his kind." Whether the Jerboa is the same animal or not, the Israelites must have been well acquainted with it, for it is found in great numbers in Syria and Egypt, and other countries mentioned in the Bible. They like to live where the soil is sandy, and make their burrows, or holes to live in, in the sides of sand-hills. These burrows are often several yards long, and the part where they sleep is made soft with grass. 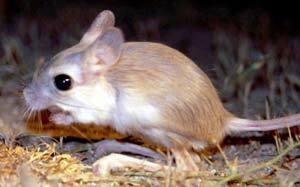 The Jerboa is about as large as a rat, and its color is a tawny yellow, something like that of dried lemon-peel. Its fur is very smooth and soft; its eyes are full and round, and its head is much like that of a young rabbit. When it eats, it sits and hold its food in its fore-paws, very much as a squirrel does. There is a very great and curious difference in the length of its legs; those in front being so short that you would hardly notice them, and those behind very long. It bounds along over the ground very rapidly; so that the greyhound, which is one of the swiftest of dogs, is often unable to overtake it. It seems, when you first look at it, to use only its hind legs in jumping, but his is not so. When it is about to take a leap, it raises its body upon the toes of its hind feet, keeping the balance by the help of its long tail. It springs and comes down on its short fore legs, but does it so very quickly that you can hardly see how it is done, and the animal seems to be upright all the time. They appear to be very fond of each other's company, and great numbers are usually found together. They sleep during the day, but like the hare and rabbit, go out of their burrows to eat and to play as soon as it begins to be dark.